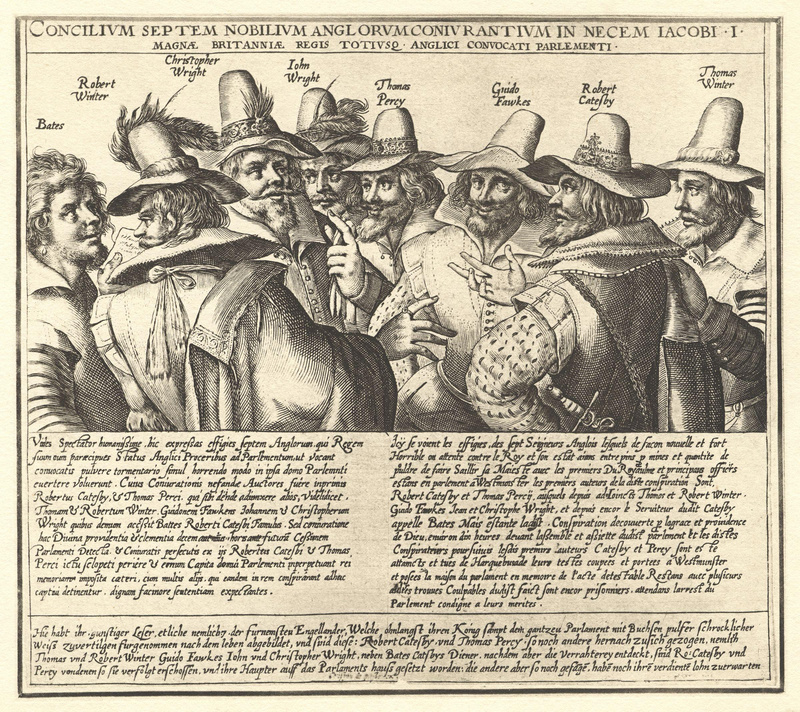 A contemporary engraving of eight of the thirteen conspirators, by Crispijn van de Passe; missing are Digby, Keyes, Rookwood, Grant, and Tresham. The main conspirator, Sir Robert Catesby, and one of his accomplice’s Sir Francis Tresham, was/would have been a first cousin, once removed of Queen Catherine Parr being great-grandchildren of Catherine’s paternal aunt, The Hon. Katherine Vaux. Catesby and Tresham were among some of the great-grandson’s of Sir George Throckmorton who did not convert to the new religion. Tresham was also a great-grandson of Queen Catherine’s uncle Sir William Parr, 1st Baron Parr of Horton. An indirect influence, Father John Gerard, was taken in by Catherine Parr’s cousins, the Vaux’s of Harrowden. The Vaux’s were noted recusant. Elizabeth, Lady Vaux, wife of Sir George Vaux [heir to his father’s barony, but pre-deacesed his father], was strong-willed and most of what we know of her comes from Sir Thomas Tresham, brother of her mother-in-law, and it is extremely biased, but was certainly possessed of a forceful character. Elizabeth and Tresham entered into legal wrangles over the estate, but in 1598 she was able to purchase the wardship of her son, the new Lord Vaux. Shortly after this, Elizabeth founded what was essentially a Jesuit college at Harrowden—a place to educate Catholic boys before they were old enough to be smuggled out of England to attend Douai. In 1605, Elizabeth was questioned over a letter she had written that made it seem as if she had ties to the Gunpowder Plot. Godfrey Anstruther’s Vaux of Harrowden devotes several chapters to Elizabeth’s activities in the early 1600s. She was never tried, either for treason or for harboring priests, and was eventually allowed to return to Harrowden, where the next few years were quiet. The Gunpowder Plot Society; an unofficial page focusing on the plot, conspirators, history, etc. This entry was posted in The Family of Katherine Parr and tagged catesby, fawkes, gunpowder plot, James I, Parr relations, tresham, vaux of harrowden by tudorqueen6. Bookmark the permalink.